What is the COVARIANCE.S Function? 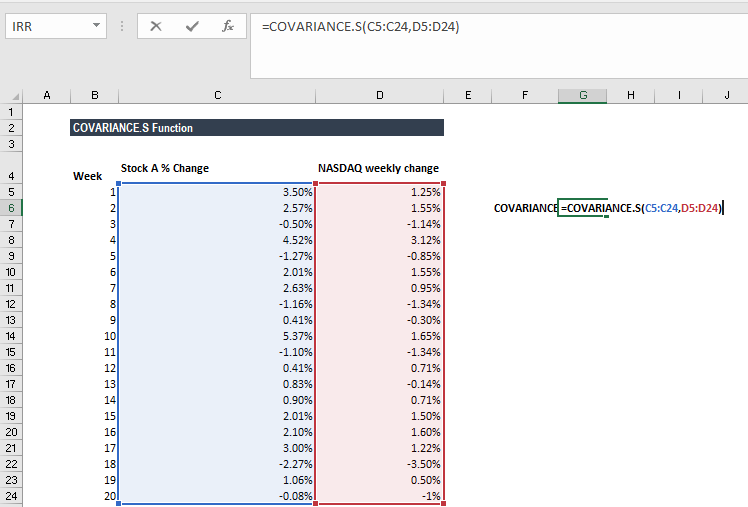 The COVARIANCE.S function is categorized under Statistical functionsFunctionsList of the most important Excel functions for financial analysts. This cheat sheet covers 100s of functions that are critical to know as an Excel analyst. It will calculate the sample covariance for two sets of values provided by a user. As a financial modeling analystFMVA™ CertificationThe Financial Modeling & Valueation Analyst (FMVA)™ accreditation is a global standard for financial analysts that covers finance, accounting, financial modeling, valuation, budgeting, forecasting, presentations, and strategy. , the COVARIANCE.S function is very useful when we want to find the extent to which two assets move in tandem, i.e. if we wish to find the relationship between the movement of BitcoinBitcoinBitcoin is the forerunner of the cryptocurrency market. Operating on blockchain technology, Bitcoin is set to disrupt the currency market. Invented in 2008, Bitcoin is now the largest cryptocurrency by market share. As of June 2017, BTC has a market of nearly $40 billion. vis-a-vis EthereumEthereumEthereum is one of the growing cryptocurrencies to contend against Bitcoin. With the rise of Bitcoin (BTC), the cryptocurrency market has been validated. Because of this, new cryptocurrencies or coins have tried to penetrate the market and grab a slice of the pie. Ethereum is Bitcoin's strongest competitor.. If we get a positive covariance, it means they move together and a negative covariance means they move in opposite directions. If we are solely looking at the returns, we will choose stocks M and P, as they show the highest potential returns. However, they also show the highest potential loss, too. If we are risk-averse, we would choose stocks M and N to diversify the amount of risk away. Array1 (required argument) – It is the first array of numeric values. Array2 (required argument) – It is the second array of numeric values. The arguments can be either numbers or names, arrays, or references that contain numbers. 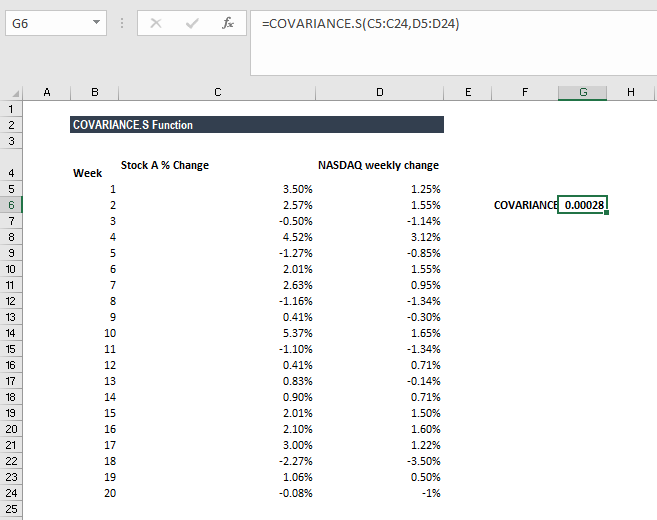 How to use COVARIANCE.S Function in Excel? 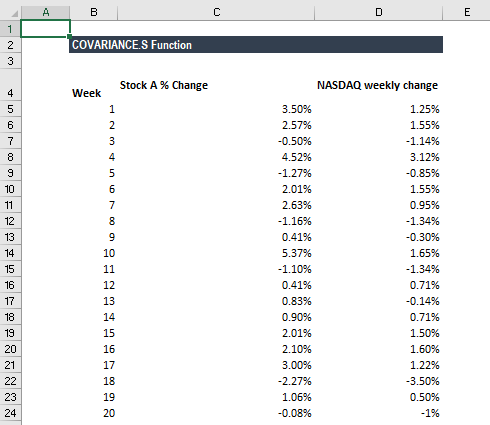 Let’s use the function to understand if there is any covariance between the stock returns and NASDAQ returns. The result indicates that there exists a positive correlation between the two. #VALUE! error – Occurs if either of the given arrays is empty. #DIV/0! error – Occurs if any of the array, that is either array 1 or array 2, is empty or contains only one data point.